Snow Patrol first formed in 1993 but reached notoriety with the release of their 2002 album Final Straw, which featured the hit singles Chocolate, Spitting Games and top 5 smash Run. Their follow-up album, 2006’s Eyes Open, spawned even bigger hits, including Chasing Cars and Hands Open, and saw the band reach global success. Snow Patrol consists of Gary Lightbody, Nathan Connolly, Paul Wilson, Jonny Quinn and Johnny McDaid. They have since released two more studio albums – A Hundred Million Suns and Fallen Empires – and a Greatest Hits compilation in 2013. 2018's Wildness marked their first studio album for seven years. Wildness taps into something raw and primitive. To celebrate the release of Wildness, Snow Patrol debuted new music videos for A Youth Written in Fire, Life and Death, Wild Horses and A Dark Switch. The band has previously released music videos for Empress, What If This Is All The Love You Ever Get?, Life on Earth and Don’t Give In. 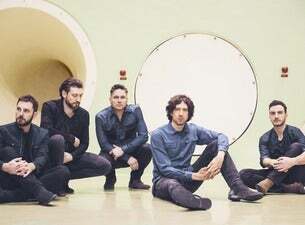 Since their 1998 debut, Songs for Polarbears, Snow Patrol have racked up an impressive number of critical and commercial accolades, including 15 million global album sales, over 1 billion global track streams and five UK platinum albums. Snow Patrol have been nominated for Grammy, BRIT and Mercury Music awards. They are currently on their worldwide Wildness tour which wraps up this May, and then the band are set for a slew of festival appearances over the summer including TRNSMT, Latitude and Glastonbury.